Anne Cornelius, CPA, P.C. is a well-established CPA firm with locations in Scottsdale and Prescott, Arizona. 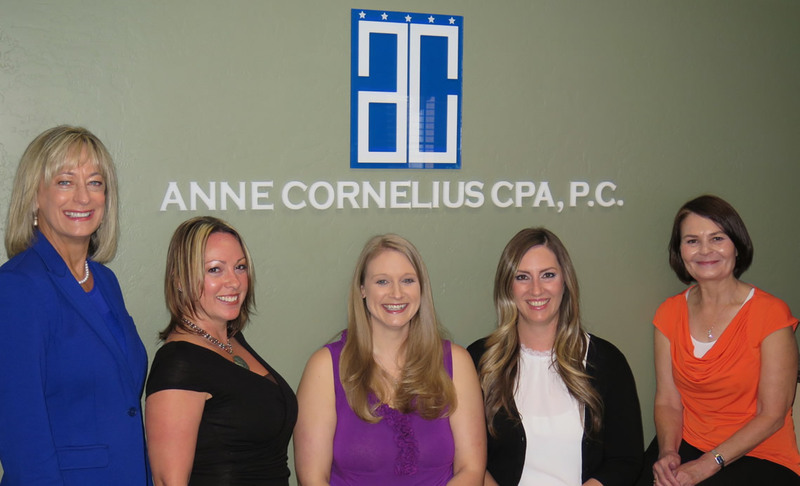 Since the firm's founding, Anne Cornelius, CPA, P.C. has been offering a broad array of accounting and consulting services to businesses and individuals throughout Arizona. While there are many accounting firms from which to choose, our clients have found our services to be timely, of the highest quality, and delivered with personal attention to their individual needs. An important member of each client's professional team, Anne Cornelius, CPA, P.C. offers much more than a tax filing service; our primary goal is to contribute to the financial success of every client. Stated simply, we are available to answer any of your questions, keep you informed of ideas and trends that affect you or your business, and assist you in solving tough accounting and business problems. We offer sound, expert advice on a variety of financial situations that individual and business clients are likely to encounter over their lifetimes. The broad range of topics includes everything from "Buying a House" to "Improving Your Retirement." We provide valuable suggestions and guidance for new business start-ups, tax planning and consultation services for our clients business operations through every stage of the company’s growth. Financial statements, when prepared professionally, can be a valuable tool in managing and growing a business. Banks and other lenders often prefer financial statements prepared by a CPA. Projections are an integral part of a complete business plan. We help our clients meet their tax filing obligations with a proactive focus on solid tax planning to minimize tax liability, while looking at the broader cash flow and profit picture. We work with many Canadian residents who buy and sell real estate in the United States for investment, income production or personal use. We provide assistance in complying with US tax obligations, and guidance with ownership structure issues and FIRPTA laws. Anne and her team are responsive, thorough, and communicative.